Was born in Belgrade, Republic of Serbia ( former Yugoslavia ) in l959. 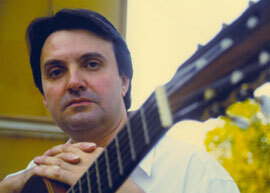 He studied classical guitar in Belgrade, and graduated from the Zagreb (Croatia) Academy of Music. Post-graduated work (two Ph. D. dissertations interdisciplinary in philology and music history) Dojčinović has made at the Belgrade University (Faculties of Philology and Philosophy). He has attended various Master Courses. Dojčinović has performed more than 3000 concerts around the world, presented numerous leactures, and gave many master classes. He acts as adjudicator for a great number of international guitar competitions, and writes for various guitar magazines and music journals. He has made more than 60 recordings ( LPs, Music Cassettes, CDs and DVD albums), and has published over 500 different compositions and guitar works for various publishing companies througout the world. Dojčinović is a frequent guest in radio and television programmes. For his artistic activity, durable work and creative contribution to the cultural expansion, development and the promotion of the classical guitar and its literature, Dojčinović has received over 50 different national and international medals, diplomas and other various rewards and prizes. Dojčinović is founder and Artistic Director of several ex-Yugoslavian and Serbian music events (Festivals, Competitions, Guitar Series), and currently teaches in Belgrade. He is also the President of Yugoslav Guitar Society & Foundation.